Permanent and maintains the warranty of your Huawei. Unlock any Huawei model legally and permanently. Fast and 100% online from the comfort of your home. How to unlock my Huawei phone with doctorSIM? Submit your unlocking request by selecting the country and the network carrier to which your Huawei is locked. We'll then send you via e-mail step-by-step instructions on how to unlock your phone. Turn on your cell phone, select the NCK option and type in the unlock code you received. Congratulations! Your Huawei is now unlocked and can be used on any compatible network in the world. How can I unlock my Huawei phone? When you insert a SIM card from a different network carrier to the one your Huawei is locked to, it will prompt for the unlock code you requested from doctorSIM. Upon inserting your SIM card, remember to type your PIN first if you have one. Will I lose the cell phone's warranty if I unlock it? Will it damage my Huawei? No, unlocking your Huawei will not void the warranty. Unlocking via IMEI is the method recommended by the phone manufacturers and network carriers themselves as it doesn't damage the phone's hardware or software and keeps your photos and videos safe. The great advantage of unlocking your Huawei by IMEI is the phone never leaves your sight as the process is 100% online. How many unlocking attempts does my Huawei device have remaining? When inserting a SIM card from a network carrier different to the original, it is possible your Huawei displays the number of unlocking attempts remaining. Normally, you will not be told how many attempts remain and you will be prompted for the Unlock Code. Type in the unlock code you received from doctorSIM to complete the process. Can I still unlock my Huawei if I don't know the network carrier? Yes, you can still unlock your Huawei if you don't know the network carrier but it's worth finding out so you can get your unlock code for a lower price. That's right! Provide doctorSIM with the name of the original operator and we'll be able to use a more economical unlocking service to release your Huawei. Verify the original network of your phone within minutes with our Huawei phone carrier check. How long will it take to unlock my Huawei phone? The guaranteed delivery time will be displayed once you have selected the country and network provider. You will also be able to see the average delivery time of the previous similar 20 unlockings once you have filled in the information required to process your request. How do I know if my Huawei has been blacklisted? Try our Huawei phone check service which scans the databases of hundreds of network carriers or by contacting the network to which your Huawei is locked. Keep in mind that only your network carrier can remove the phone from the blacklist. Will my unlocked Huawei work on any network in the world? Our unlockings are international and valid for all compatible network carriers worldwide. 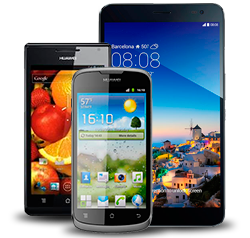 We are the global market leader in unlocking cell phones. You will be able to use your Huawei with any network carrier. Your Huawei's warranty remains valid. You can continue to use your Huawei as normal during the unlocking process. Permanently unlock your phone without leaving your home or office. Fastest unlock code turnaround on the Internet. Easy-to-follow instructions delivered around the clock (automatic server).